Early Monday morning I fly back to the mountains and I must admit that I’m ready to be back home. It’s been good down here, warming up on the Gulf coast and being with my mom, but I miss my bed, my pantry, and swimming. Two weeks of little to no exercise and eating way too much food makes a not-so-fit and not-so-happy me. Getting back into my routine will be oh-so-wonderful! 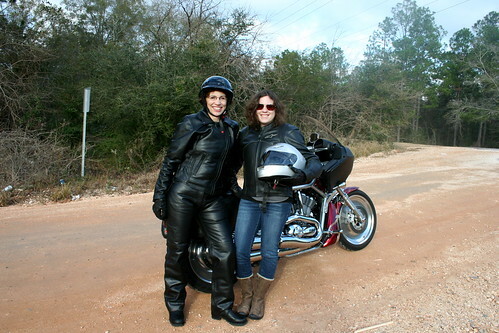 But we’ve been having fun–including my first motorcycle ride last Sunday. That’s me and my mom hamming it up for the camera. Her fiance has been outfitting her in leather and Harley jackets and other paraphernalia, and it’s pretty funny to watch, given that she’s never been a motorcycle type person ever in her life. And surprisingly, I even had fun. 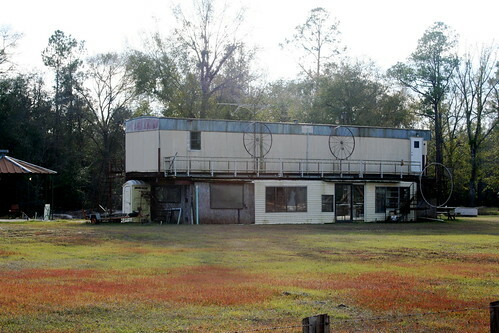 Oh, and we checked out the infamous double decker mobile home–it’s for sale, any takers? And for a few days we went to Cheaha State Park up in the mountains in Alabama–yup, Alabama has mountains, I totally forgot about that–and I drove down to Birmingham to check out Jones Valley Urban Farm. 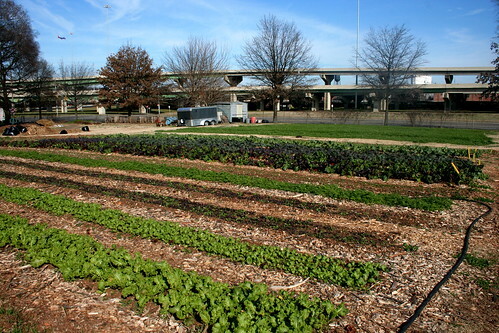 Located in the northern section of Birmingham, the farm is pretty cool: 3 acres of mixed farm production and community garden plots, a large number of educational programs with over 70 kids visiting the farm daily during school, and a place with a huge impact–tons of community gardens have developed as a result of the farm. Oh, and a 10 month growing season (if not year-round)–holy cow, awesome! The farm is a really inspiring place and I highly recommend anyone checking it out who is in the area. But in food-related news, how about some carbs? I know, I know, it’s January and we’re all feeling a little over-fed. Bread might not be on the to-make list, and these aren’t revolutionary, they’re just Celine’s Sauerkraut Rye Bread that I made last February. But a newish bread recipe is always a good thing, right? 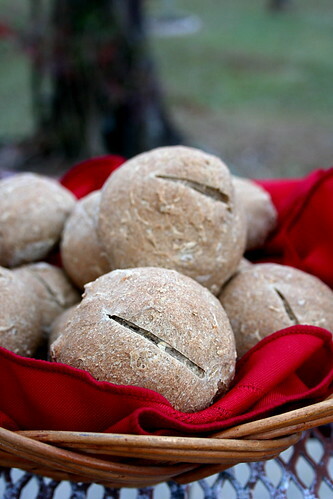 By substituting the buckwheat for rye, the rolls have a bit less of a bite, but are delightfully dense. Not dense in a bad way, but dense in a toothsome crumb kind of way. The sauerkraut lends a moistening element to the rolls without being overpowering–in fact, no one noticed that there was anything “different” in the rolls. And I certainly didn’t tell the kids what the mystery ingredient was. If formed into a loaf, I’d bet that the bread would make a perfect sandwich base–maybe for fakeloaf sandwiches? Rolls or bread loaves, the bread was a perfect accompaniment to a potluck meal, and while not gluten-free, they’d satisfy any vegan or omnivore. Proof the yeast in the water for 10 minutes or so, until the yeast becomes bubbly and foamy. In a large mixing bowl, combine the sauerkraut, molasses, suger, and salt. Mix in the proofed yeast. Place the dough in an oiled bowl, cover with a towel, and place in a warm corner of the kitchen for 1-2 hours, or until the dough has doubled in size. Punch down the dough and transfer it to an oiled loaf pan, if making a loaf. To make the rolls, divide into 12 even pieces and pinch into round balls. Place on an oiled baking sheet. Cover again with the towel and place in a warm corner for 1 hour, or until the dough has doubled in size again. Once the dough has doubled, preheat the oven to 350 F.
Bake the loaf at 350 for 45 minutes-1 hour or the rolls 35-40 minutes. You will know when the loaf/rolls are baked when you tap/knock your knuckles on the top of the loaf and it sounds hollow. Allow to cool 15-20 minutes. Makes 1 loaf or 12 rolls. Hey I’d love a double decker trailer! Seriously, I would live there for sure! Looks like you’ve been having a grand ol time, what a way to spend the holiday season. Those rolls look fantastic, I adore sauerkraut so I’ve gotta give these a try – thanks for the recipe. Such an intriguing (and fantastically hearty-looking) bread! I don’t think I’ve ever eaten sauerkraut, actually, but we always have some in the fridge… Perhaps this is the perfect opportunity to give it a taste, and make something with it too. That double decker mobile home is out of control! I sort of love it. that is too funny that your mom’s fiance is decking her out in motorcycle gear. tee hee! i love it! hooray for your first motorcycle ride! dan and i have a motorcycle – it makes me wish it would warm up a bit so we can take it out soon. i haven’t been riding since the summer. that urban farm = the best! a 10 month growing season – wow! oooooh, i’m so jealousfaced. ah ha ha! the double decker trailer had me giggling, and Celine’s sauerraut bread looks awesome – your take on them sounds outstanding. i’m gonna have to make these for my mom sometime – she loooooooves sauerkraut the absolute most! now i need to make ‘em gluten-free so i can enjoy them too. yum! Some great shots, here! I must think about the sauerkraut bread, though: what should go inside it? Should it be sliced & made into sandwiches, with something savory inside? Can it do sweet, as well? As much as I like to travel, there’s nothing like getting back into a normal routine. Looks like you had a great trip! That double decker mobile home is too cool. And beautiful looking rolls! For a 10-month growing season I might consider living in a double-decker mobile home. Looks like a fun trip, Jes, and I’m sure you’re ready to get back into your kitchen. I’m going to Birmingham and Montgomery next week to visit my sister and her family. My son thinks it’s so redneck there he won’t even go with me anymore! Your bread looks fantastic. I’m going to cook vegan dinner for omni friends while at my sister’s. I am working on my menu and I’m sure I’ll be revisiting your blog for ideas. YOW YOW! You Vegan Biker Babe you! Those rolls looks amazing… interesting secret ingredient! Those rolls look awesome! And so do you in your biker gear. I never got the appeal of motorcycles either until I rode one! They are really fun although I can’t imagine riding in traffic or on the interstate! That stacked trailer is too funny! Haha your comment cracked me up. I almost put “rack…of lamb” instead of garlic bulbs but then thought “nah…not on a vegan blog”. I should have just went for it. i love this soup. and i love your blog. it saves me so much meal planning time. thank you thank you!! !